A new attorney general nominee to replace the departing Eric Holder has become the latest casualty of election-year politics. A White House official on Tuesday confirmed reports that President Obama will wait until after the midterm congressional elections on November 4 to name his pick to lead the Justice Department. Earlier reports indicated that the president wanted to move swiftly to replace Holder so that Senate Democrats could potentially confirm the nominee during the lame-duck session next month. In delaying the decision, Obama was said to be honoring the wishes of Senate Democratic leaders who did not want a polarizing pick to become mired in their aggressive–and increasingly desperate–push to hold onto to the chamber in the next few weeks. The selection is still expected soon after the November election. That scenario could still give Senate Democrats a limited window to confirm the nominee during the lame-duck session later in the month. At the White House briefing on Tuesday, press secretary Josh Earnest would not directly comment on the timing of Obama's announcement, but he noted that "it would take a little bit of time" for the president and his advisers to decide on the right person to lead the Justice Department for his final two years in office. The most frequently mentioned contenders are the labor secretary, Thomas Perez, a former White House counsel, Kathryn Ruemmler, and the current solicitor general, Donald Verrilli Jr. None of them would be considered consensus choices designed to skirt Republican opposition. Perez formerly headed the Justice Department's civil rights division and was confirmed only narrowly to head the Labor Department. Ruemmler likely would face questions about her role in the White House's handling of the 2012 Secret Service prostitution scandal in Cartagena, while Verrilli is known mostly for defending the Affordable Care Act, a top GOP target, before the Supreme Court. Obama may not be able to completely escape electoral considerations when he does make his choice, however. A number of key Senate races, including those in Louisiana and Georgia, could be headed to run-off elections that would be held after the congressional lame-duck session and could be crucial to determining control of the chamber. 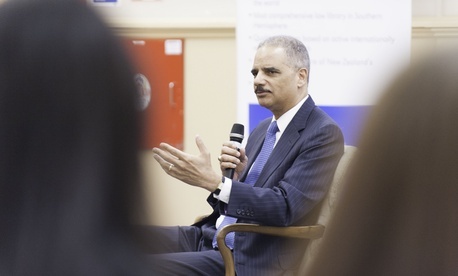 Holder, meanwhile, has said he'll stay on until his successor is confirmed.